Jack Fenton would be the first to admit that he is not the quintessential agility handler. His dyspraxia means that even basic handling techniques are ones that he struggles with. What makes it even more complicated is the fact that the dog he wants to run with is not a sleek Border Collie nor a lightning fast Spaniel. 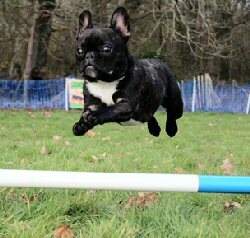 It's a two year old French Bulldog named Kevin who, perhaps just like him, might not ‘belong’ to traditional agility circles for a number of different reasons. For starters, my background is in Assistance Dog Training and Scentwork. Sports, such as agility, were never something I could foresee myself participating in. The nature of competition never interested me, and my knowledge of Agility stemmed from occasionally watching dogs at Crufts. Then I started dating Jodie Forbes and, alongside that, set up Make Your Mark with her, my interest was piqued. I began watching more agility runs, attending agility shows, following renowned agility trainers. Still, though, nothing really grabbed me. And then, as I watched more and more agility runs, I realised what about it didn’t interest me. As in most dog related activities, certain breeds dominate both the leader boards and the marketing for each sport. For example, in assistance dog work it tends to be Labradors and Golden Retrievers. There is good reason for this, and obviously Collies and Spaniels are the go-to agility dog. But what interested me, what really captured my attention, was the idea of running an agility dog that wasn't typical to the sport. I like seeing how dogs and people progress through training and just the passing of time. For me personally, working with a Collie and building him up to winning at Agility shows just didn't light a fire inside me. This went hand in hand with my goal to improve the welfare of French Bulldogs as a whole. Their health issues have been well-documented, and I am not nearly as qualified as a vet to offer my opinion on them. But, there is a staggering amount of opinion out that there says that French Bulldogs are dumb. And, with that opinion, French Bulldogs remain overweight, fat and slovenly dogs who don’t get to exercise their brains or their bodies. Every French Bulldog I have met has been bright, bubbly and capable of so much more. My other Frenchie, Uggie, who is also doing agility training at five and a half, is arguably the smartest out of all of my dogs. Kevin has been trained to do Assistance Dog demos by picking up dropped objects, opening cupboards and pulling socks off of people's feet. He's a poster boy for our tracking service, and he has begun his agility training and competed at Steeplechase competitions. I want to inspire people to do things with their French Bulldogs. Whether it's Agility, Freestyle to Music, trick training, or Tracking, whatever it is remains irrelevant. What matters is that they are doing something. I have a goal of getting Kevin to compete at Crufts. I might be laughed it. I might be derided, and it might never succeed. But that’s okay. I would rather aim high and miss than aim low and succeed. Kevin may never win at a Champ show. He may never get to Crufts. But I’ll be damned if we, the unlikely pair who don't fit the mould of what Agility should be, don’t give it our all. And if he inspires one person to realise the potential of their French Bulldog? Then it’ll be even more worth it. 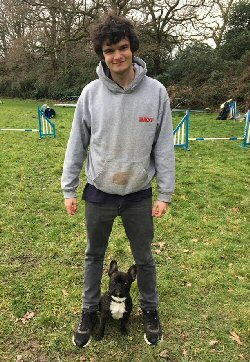 Jack Fenton is a 21 year-old dog trainer based in Bournemouth, Dorset and co-founder of Make Your Mark Dog Training, which provides services such as Tracking, Agility and Trick Training. He is a full member of the Institute of Modern Dog Trainers, an Approved Instructor with the Dog Training College and a fully qualified Tracking Instructor with the UK College of Scent Dogs. Jack owns three dogs – Raffi, a Golden Retriever who is training to be a PTSD Assistance dog and Kevin and Uggy who are French Bulldogs. They are training to compete in Freestyle to Music, Obedience and Agility respectively. 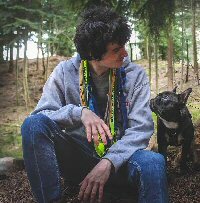 Jack wishes to promote disability awareness and acceptance to do with his own Autism, Dyspraxia, OCD and mental health disorders, and is passionate about inclusivity in the dog training world with a focus on the promotion of welfare and training for French Bulldogs.